Description: Depauperate erect low shrub, ± intricate, 30–50 cm high, ± spiny, older stems with pale grey to dull brown, corky bark, rhizomatous. Leaves crowded on very short lateral branches, eventually shed, linear, 1–5 cm long, ≤ 2 mm wide, apex acute, margins recurved to revolute, papery, sessile. Flower clusters at separated nodes, flowers subsessile, usually 3–5 per cluster. 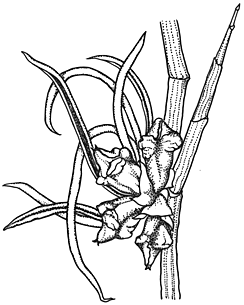 Perianth in female flowers divided for a third to half of its length, strongly thickened and angular in fruiting stage, in males divided for slightly more than half its length. Anthers 0.8–1.3 mm long. Achene trigonous, 2.0–2.5 mm long, smooth, brown. Distribution and occurrence: Inland NSW; also Victoria and South Australia. Typically in silt in and beside dry inland lakes. Leaves are sometimes attacked by an orange fungus. The single subspecies in NSW. Characters and distribution as for the species in NSW.